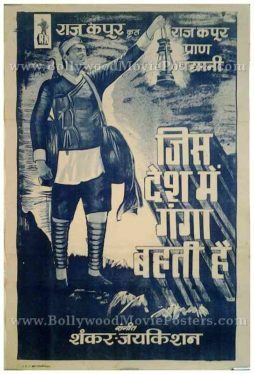 Bollywood poster for sale of the hit Hindi film Jis Desh Mein Ganga Behti Hai (1960). Featured here for sale is a reissue poster of the 1960 black and white Bollywood movie which featured the greatest Bollywood entertainer of all time, Raj Kapoor (also known as The Show Man of Indian cinema) in the lead role opposite actress Padmini. Printed and circulated somewhere in the early 2000s, this reissue Jis Desh Mein Ganga Behti Hai movie poster was originally designed for publicity of the recent re-release of the film but never ended up being used. Jis Desh Mein Ganga Behti Hai is widely remembered for its title song, which became a patriotic anthem of sorts and is played till today. The poster features Raj Kapoor and Padmini in an iconic pose taken from a key song in the film. Pran who plays a bandit in the film is seen in a much smaller sized portrait in the corner. A stunning sky background is seen in this beautiful Raj Kapoor movie poster. Jis Desh Mein Ganga Behti Hai (Nation Where The River Ganges Flows) is a hit 1960 Hindi film produced by Raj Kapoor starring him in the lead role. The other cast of the film includes Pran and Padmini. The film bagged many prestigious awards at the National Film Awards as well as the Filmfare Awards. Songs from the film, in particular the title track, are fondly remembered till today. 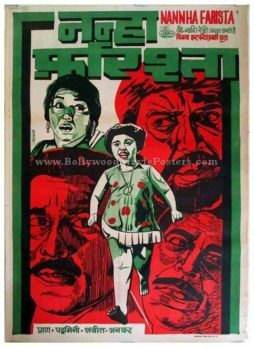 Bollywood poster for sale of the 1970 cult Hindi film Mera Naam Joker. Featured here for sale is a reissue Bollywood poster of the 1970 film that was produced, directed by and starred the showman of Indian cinema, Raj Kapoor. This Raj Kapoor movie poster features the key star cast of the film – Simi Garewal, Padmini, Manoj Kumar, Rishi Kapoor, Dharmendra, Kseniya Ryabinkina & Rajendra Kumar. Printed and circulated somewhere in the early 2000s, this reissue Mera Naam Joker movie poster was originally designed for publicity of the recent re-release of the film but never ended up being used. 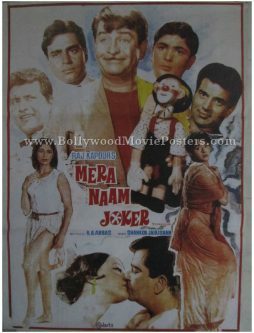 In this Mera Naam Joker movie poster, Raj Kapoor is seen in a brilliant photographic still holding the iconic Mera Naam Joker doll prominently on the top. A steamy kiss scene featuring Raj Kapoor and Russian actress Kseniya Ryabinkina is seen at the bottom. Mera Naam Joker starred Raj Kapoor in the lead role. In this classic, Raj Kapoor essayed the role of a circus clown who must make his audience laugh at the cost of his own sorrows. Mera Naam Joker also marked the debut of Raj Kapoor’s son Rishi Kapoor. Mera Naam Joker reportedly took six years to make and was funded by Raj Kapoor’s personal savings. The film was declared a flop at the box office but has attained cult status over the years and earned the praise of critics. Mera Naam Joker is regarded as one of Raj Kapoor’s finest works today with film critics heralding it as a “misunderstood masterpiece” due to its box office failure at the time of it’s release. 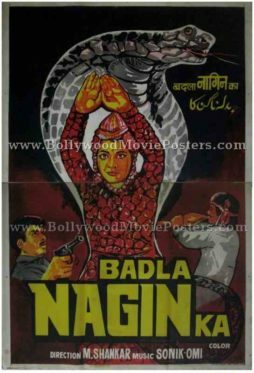 Vintage Bollywood poster for sale of the old Hindi film, Badla Nagin Ka (1987). This is an actual surviving Bollywood movie poster for sale of the 1987 fantasy Hindi film directed by M. Shankar which starred Jivita, Shalini, Padmini and Rajiv in lead roles. Printed and circulated during the first release run of the film (late 1980s), this very rare vintage Bollywood poster for sale was designed and printed for publicity of the film but never ended up being used. The film’s plot hinged around the story of a revenge seeking woman who turns into a serpent. The lead actress is seen prominently in this poster doing the infamous “Nagin dance,” i.e. serpent dance. Originally designed in hand painted oil on canvas format by an art studio in Kolkata, this vintage Bollywood poster for sale features quirky hand drawn renditions of the lead characters of the film. A large portrait of a cobra is seen in the background of the dancing woman. The bottom of this hand drawn poster shows smaller figures of a snake charmer and an actor holding a gun. This Bollywood movie poster for sale is a two sheeter. Two sheet posters comprise two separate individual single sheet posters measuring approximately 40″x30″ inches each. When pasted together they line up perfectly and together form one single two sheet poster. In the image provided, there may be a slight gap visible between the two – as the images of the top and bottom half have been photographed individually and then joined together digitally. When framed or pasted, there will be no gap visible between the two sheets and the appearance of the poster would be seamless – i.e. just like a single sheet poster. Very rare, original hand painted Bollywood poster of the Raj Kapoor hit, Jis Desh Mein Ganga Behti Hai (1960) for sale. This is an actual surviving poster of the 1960 black and white Bollywood movie, which featured the greatest entertainer of all time in Bollywood, Raj Kapoor (also known as The Show Man of Indian cinema) in the lead role opposite actress Padmini. This black and white Bollywood poster was printed and circulated several years after the first release of the film (Somewhere in the early 1970s) and was originally designed for publicity of the film but never ended up being used. This black and white Hindi movie poster was originally designed on a hand painted canvas, making it very collectable. The artist captures Raj Kapoor holding a lantern. The title of the film appears on the right in Devanagari Hindi font, with an appearance of shadows created by the lit lantern on the top creating a somewhat 3D effect. Original Bollywood movie poster of the old Hindi film, Nanha Farishta (1969) for sale. This is an actual surviving vintage publicity poster of the 1969 Hindi film that featured Pran, Balraj Sahni and Johnny Walker. Printed and circulated a few years after the first release of the film (somewhere in the early 1970s), this old Bollywood poster was printed for publicity of the film but never ended up being used. This very rare vintage Bollywood poster features stunning hand drawn artwork. The little angel or small wonder, Baby Rani is seen in the center with faces of the supporting actors drawn all around. 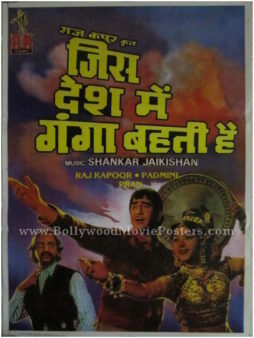 Typography used in the poster is primarily in Devanagari Hindi, with a translation of the title in English on the top. Nanha Farishta is an old Bollywood movie released in the year 1969 that starred Pran, Ajit, Anwar Hussain, Baby Rani, Padmini, Balraj Sahni, Johnny Walker & Mukri. Hand painted old Bollywood movie poster of the hit Hindi film Jis Desh Mein Ganga Behti Hai (1960) for sale. This is one of the rare surviving movie posters in Indian cinema deliberately printed in black and white to reflect the mood of the film (which was shot entirely in black and white). This old Raj Kapoor movie poster was printed and circulated during the first release run of the film (early 1960s) and was originally designed for publicity of the film but never ended up being used. The poster was originally designed on a hand painted canvas, making it very collectible. The artist captures Raj Kapoor in an emotionally charged rendition. Pran who plays a bandit in the film is seen on his side in a much smaller sized portrait. The lead actress of the film Padmini is seen in a sensuous avatar at the bottom with an accentuated pout. 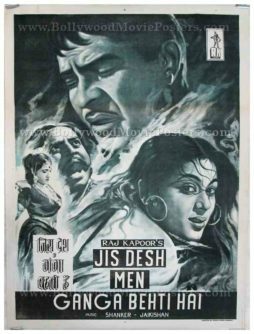 Typography used in this poster is seen in English at the bottom, whereas a translation of the title in Devanagari Hindi is also seen towards the bottom left of this beautiful old black and white Raj Kapoor movie poster. Extremely rare, minimal Bollywood poster of the old Hindi film Afsana (1966) for sale. This is an actual surviving vintage Bollywood poster of the 1966 Bollywood movie that starred Ashok Kumar, Pradeep Kumar, Padmini & Helen. Printed and circulated somewhere during the first release of the film, this movie poster is an excellent example of the minimalist movement in hand painted Bollywood poster design. This minimal Bollywood poster was originally designed on a hand painted canvas, making it very collectible. The Bollywood poster artist has chosen a very minimalistic approach in hand painting this poster. The typography used in this poster is entirely in English except for the title translated in Devanagari Hindi & Urdu. This poster has been marked as “Rarest of the rare” as no other copies of the same are known to exist. Afsana (Story of Love) is a 1966 Hindi film starring Ashok Kumar (fondly referred to as “Dadamuni”) – one of the most iconic and popular actors in pre-independence India. The film tells the story of a misogynist who eventually falls in love with a woman. Quirky hand painted old Bollywood poster of the hit Hindi film Dil Hi To Hai (1963) for sale. 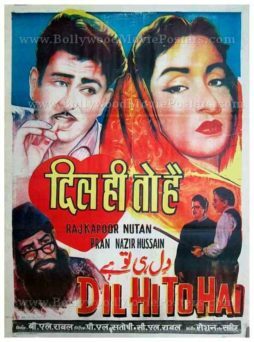 This is an actual surviving vintage poster of the film Dil Hi To Hai, which featured the greatest entertainer of all time in Bollywood, Raj Kapoor (also known as The Show Man of Indian cinema) in the lead role opposite Nutan. The film is widely remembered for its blockbuster song “Laga Chunari Mein Daag,” which is played till today. Printed and circulated a few years after the first release of the film, this quirky hand drawn old Bollywood movie poster was originally designed for publicity of the re-release of the film but never ended up being used. This poster was originally designed on a hand drawn canvas by a small time poster art studio in Delhi, making it very collectable. A large hand painted portrait of Raj Kapoor smoking a cigarette is seen on the top of the poster, with a demure looking Nutan on the opposite side. The title of the film is seen intertwined with a red heart (Dil translated to English means heart). Typography in English, Devanagari Hindi as well as Urdu is seen used on the poster. Dil Hi To Hai is a 1963 Hindi film starring Raj Kapoor and Nutan in lead roles. The Bollywood movie is based on the story of an impoverished widowed Hindu nanny who raises an abused and abandoned Muslim child.